Giving Dealers back their independence. Put a Champion in your engine. Champion provide an extensive line of lawn & garden plugs for everything you need to keep your yard beautiful. As a matter of fact, Champion is the original plug for most of the small engine manufacturers. Diamond designed cutting edges for aggressive cutting performance. Greater momentum provides higher impact resulting from 10% greater line mass. Special copolymer formulation for excellent wear, durability and cutting performance. Cutting edge sharpening Equipment, The leader in quality ABN and diamond Grinding equipment. Prevent engine problems! An ultra-concentrated, multi-functional fuel stabiliser proven to prevent ethanol related problems while stabilising fuel. For both 2 and 4 cycle engines Ethanol Shield protects engine components and keeps your engine starting and running easily all year round. Commercial Engines. Unmatched power, durability, and reliability. Start easier, perform stronger, last longer. With Kawasaki, you get all the power you expect, backed by almost a half-century of setting the standard for engine productivity, reliability and performance. The fix for poor or non-running engines! 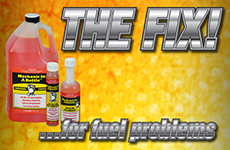 Mechanic in a Bottle provides both a reliable, fast and easy diagnostic tool to identify problems and a formula to rejuvenate and restore engines to top working condition – avoiding repairs and down time. Make it happen! Make it Mojack! The smarter Ride-On & ZTR lift. Customer designed products to secure and lift virtually any riding mower on the market easily and safely. Don't just ask for a spark plug, insist on NGK. NGK spark plugs are designed for superior performance as they extract maximum performance from the engine across the rev range. Universal RINO-TUFF push button trimmer heads. Supaswift is a true Australian iconic brand having been established as a producer of lawn mowers by Vulcan in the Melbourne suburbs in the 1950’s. Today, Supaswift lawn mowers are highly regarded as a mower of choice for both domestic and commercial users, is it any wonder this great Aussie brand is the success it is today. Delivers professional results for everyday use. Engineered for ultimate impact resistance, processed to minimise line splits and frays. Designed to provide weld resistant performance. TUFFCUT offers a comprehensive range of spare parts for the Outdoor Power Equipment Market. From lawnmower blade and bolt packs to our Tuff premium quality trimmer line, we have a product to suit your customers needs. Specially formulated to maintain air tight seals even in extreme conditions. Tygon Tubing resists swelling, hardening and cracking. Tygon's translucent material allows for clear inspection of flow. The professional's choice for optimum all round performance. Full mass line promotes longer wear. Up to 50% noise reduction in larger diameter areas. Increased RPMs allows use of larger diameter lines resulting in more impact power. Walbro is the world's largest manufacturer of ignition and fuel management components for outdoor power equipment, marine & recreational applications. Australian made brushcutter attachments to replace nylon cord and conventional steel blades. Established in 1993, Powerup Lawncare Products is the whole goods division of Roy Gripske & Sons group of companies. PLP distribute the following brands through a national dealer network; Bushranger, Maruyama, Efco, Oleo-Mac, Craftsman, Stiga, Ryan, Hustler and BigDog. 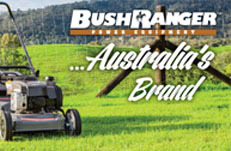 PLP is one of the largest independent distributors of outdoor power equipment in Australia. The principle of quality is reflected throughout our Bushranger product Range and is in the forefront of our minds in everything we do. Our products are rigorously tested here in Australia and we only source the best technology and quality from around the world. For more information please visit our web site. Established in Sweden in 1934, STIGA has been innovating premium garden consumer products for more than 80 years. Stiga maintains high quality lawn tractors that excel in performance – all year round. Their products continue to be in a class of their own providing superior quality and safety, with ergonomic and environmentally-friendly features. They are designed to provide the best solution to any challenging task with lots of power under the bonnet and first-class collecting ability so you can sit back and enjoy the ride. In 1895 the Maruyama brand was founded on quality and durability. Throughout the years Maruyama has become a world leading manufacturer of 2 cycle hand-held landscape equipment. This high quality Japanese brand brings durability and performance to the market. Their name is synonymous with commitment to the professional. PLP is proud to represent this outstanding brand. For all of the Maruyama range and more information, please visit our website. The year was 1978; the demand of machinery was rising. Giacomo Ferreti created the factory branded Efco in the north of Italy. Not long after, Efco successfully became one of the leading manufacturers of brushcutters in France, Germany, UK, Spain, Poland, and USA due to the brands reputation for high quality products and durability. Today Efco has a large range of chainsaws, brushcutters, powercutters, trimmers and water pumps. For more information please visit our website. Founded in 1972 by Ariello Bartoli, Oleo-Mac quickly established itself as a maker of chainsaws produced and assembled on an industrial scale. Serving the market with precision and quality Oleo-Mac quickly stood out and became a strong brand joining the Yama Group in 1989. Since then, Oleo-Mac has created its commercial brand on an International scale becoming a market leader in countries such as France, Germany, UK, Spain, Poland, and USA. 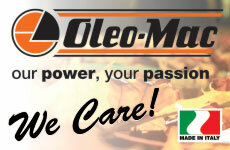 Oleo-Mac's range includes chainsaw, brushcutters, powercutters, trimmers and water pumps. For more information please visit our website. The market leader in North America for Lawn Tractors. The most recognised brand in the USA is now available here in Australia. Craftsman Ride On mowers are built to last and designed to give you the confidence to complete the job no matter the size of the lawn. Durability and consistency are values that Craftsman is proud to carry with each and every product. If you need superior Lawn Tractors, Craftsman will provide the edge to success. For more information please visit our website. The first ZTR mower was created in 1964 by Hustler. Hustler have the highest quality and the most productive products available on the market today - leading as the pioneer in the ZTR market. 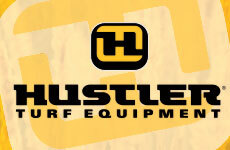 Hustler ensures maximum durability and functionality as well as advanced design and rigorous testing. Now Available in Australia, check out the Hustler range on our website. As a new edition from Excel industries, BigDog is the perfect ZTR for residential or commercial lawns, featuring high quality and precision. The new powerful, red ZTR has now arrived and is readily available in Australia. With 5 series and 12 models, the BigDog range has a mower to cater for every kind of lawn. For a perfect cut and a tool that doesn't disappoint, look for BigDog. More specifications are available on our website.